Hey you! Yes, YOU! I like you… a lot. You brighten my day. I feel so lucky to have such incredible readers; readers who make me feel amazing and inspired every single day. Many of you have been tweeting with me or posting on my Facebook page letting me know which recipes you’re loving, or what’s inspiring you to cook. Some of you have even sent me an email saying how my recipes have encouraged you to eat healthier. You are all so sweet and I’m OVERJOYED that this blog has inspired you. I don’t know what to say other than… THANK YOU! It’s appreciated more than you know! Now, let’s talk about quesadillas. I love them. Adore them. Salivite over them! Yeah, I’m pretty weird but you’re probably okay with that by now if you’re still reading this. 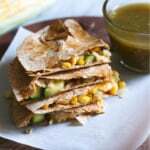 Quesadillas are a traditional mexican dish that usually involves cheese and a savory mixture of vegetables and/or meat. They’re one of my favorite meals to put together at the last-minute because it involves throwing delicious combinations in a tortilla and toasting or frying it until crispy and golden brown. 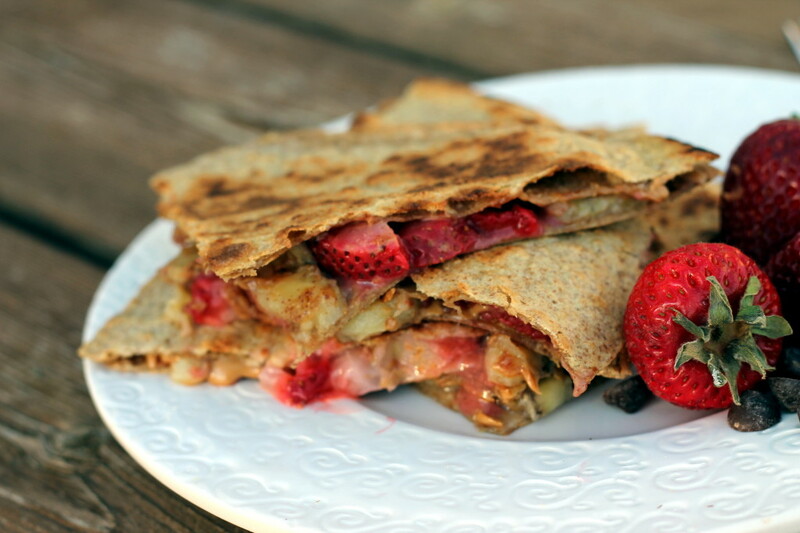 These days the traditional quesadillas have evolved into something wonderful: breakfast (or dessert) quesadillas! It’s as simple as this: I am obsessed with the peanut butter and banana combo. Typically when I’m in a rush I put the duo on an english muffin and barely remember inhaling my breakfast, but I was getting a little bored with that. 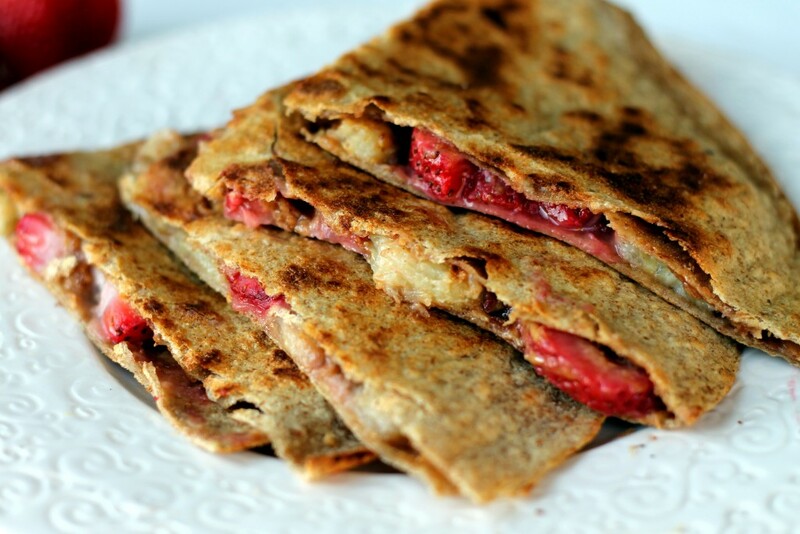 So instead of the usual, I thought I’d make it interesting by making peanut butter and banana quesadillas and adding in seasonal, ripe strawberries for a sort of PB&J twist. My mind was BLOWN AWAY after one bite. In all seriousness, yours probably will be too. 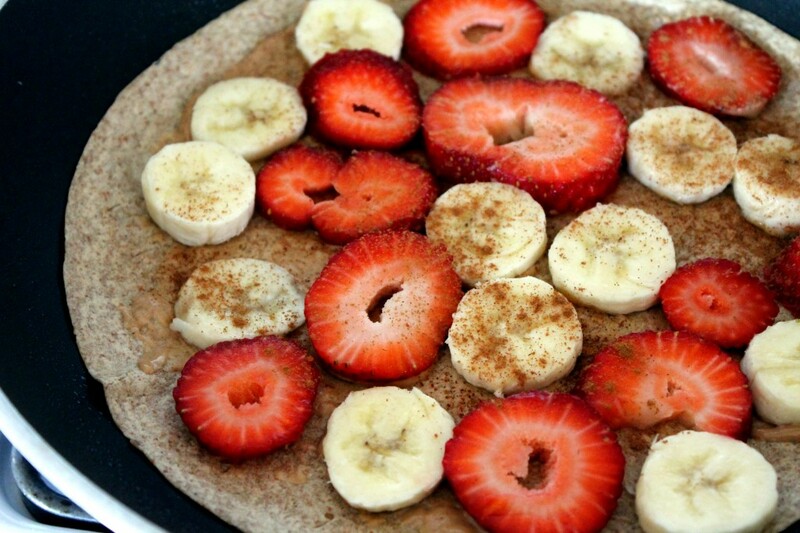 If you’ve never experienced the peanut butter, strawberry, and banana combo–prepare to be amazed! 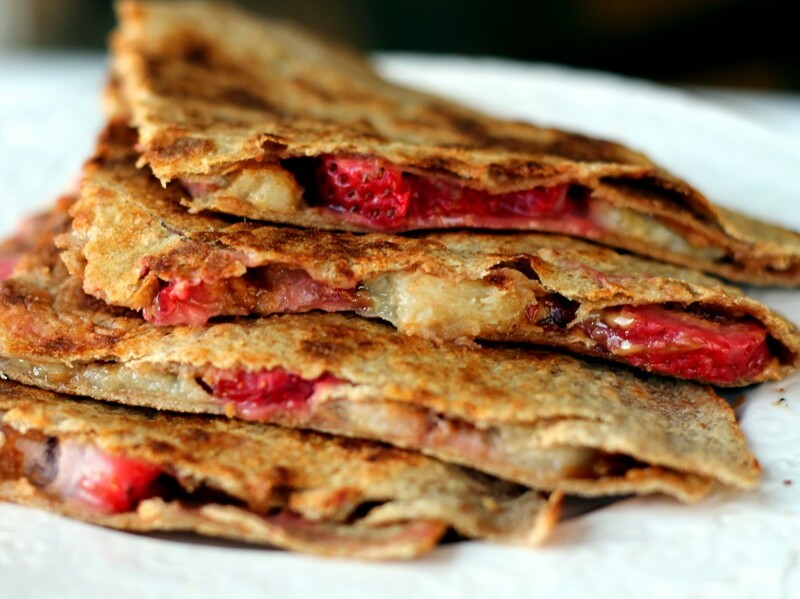 First of all–the strawberries in the quesadilla! They almost taste like they were roasted–exploding with flavor and juicyness from the heat. It reminds me of a peanut butter and jelly sandwich, except with a fresh, more interesting appeal. The crunch of the tortilla and the warm, creamy peanut butter makes me wish I could go back to grade school and demand ask nicely for this in my lunchbox. When making quesadillas I always use whole wheat-low carb tortillas because I love the nutty flavor of them, plus whole grains keep you fuller, longer. I recommend using Joesph’s Tortillas, but any whole grain tortilla would work well. This also would be an optimal pre or post-workout snack or meal because of the good carbs and healthy fats. Additionally I HIGHLY recommend trying this for dessert. It’s pretty guilt-free, perfect for sharing, and kids will even love them. Plus they are vegan, and you could certainly make them gluten-free by using GF tortillas. The possibilities are endless! Think about it. 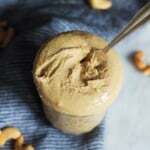 Wouldn’t replacing nutella for peanut butter be dreamy? Or perhaps sprinkling in a few mini chocolate chips? What about dipping them in a warm chocolate sauce? THAT could be like tasting a little bite of heaven. But those are just suggestions, feel free to get creative! As requested, nutritional information is included. Just please note that after this quesadilla, you’ll never want to settle for a traditional PB&J again. If you try them, be sure to let me know what you think. 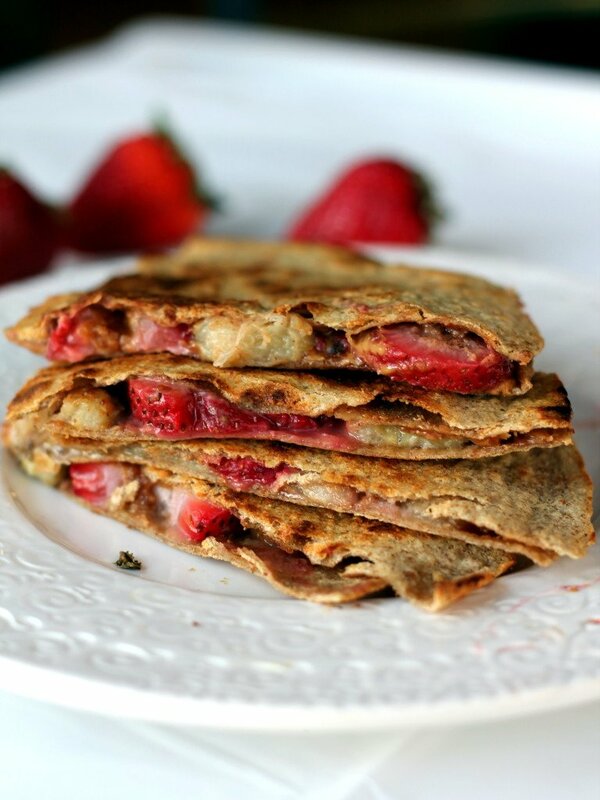 Delicious breakfast quesadilla stuffed with peanut butter, bananas and fresh strawberries. A great on the go breakfast. 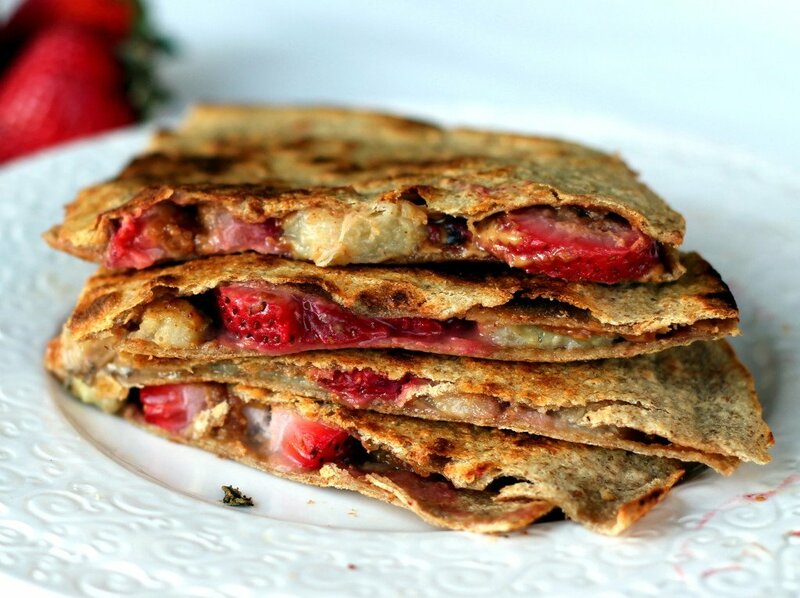 122 Responses to "Peanut Butter, Strawberry, & Banana Quesadillas"
I’ve done this with apples… but never bananas and berries. My kids will love this! I used to make these in college but I’d use a high-protein wrap (about 10g) and add 2 tablespoons of Naturally More peanut butter to boost it to 20g of total protein. Back then, Hood had the Calorie Countdown low-carb, high protein milk which offered 13g of protein which I drank with the sandwich. Unfortunately, they reduced it twice and it now only has 5g per serving. Oh well, the wrap idea was definitely tasty. I am a fanatic for banana and peanut butter. This looks dynamite. Cream CHEESE would make it a real QUESAdilla. It would also make it devastatingly delicious. Yes, it would, Rachel. And it would be incredible. I think adding raspberries and cream cheese would be perfect in a quesadilla. Wow! 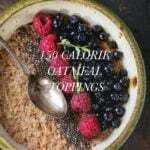 I’m always on the lookout for exciting new breakfasts, this definitely warrants a try! Wow! I am a huge peanutbutter & banana combo lover, too. My roommate makes strawberry-banana-peanutbutter sandwiches all the time, I think I’ll have to make this for her on her birthday morning! awesome blog.. having a good time going thru it!!! I do this with my s'mores now. Add a slice of strawberry is like a piece of heaven! I'm going to make this for Mason and the boys for breakfast tomorrow morning. It looks yummy, plus I have the supplies to do it. Made one for my son Mason. He LOVED it! Ate the whole thing with a glass of Chocolate milk and a yummy greek/coconut yogurt with fresh blueberries and sliced bananas. Yummy breakfast and very healthy for you. For a delicious dessert…nutella and bananas or nutella and mini marshmellows…like a crepe but without the hassle. It's our daughter's favorite dessert! Hello, I am trying to find breakfast ideas that I can cook and eat for about 3 days. I rarely have enough time to cook in the morning before leaving for work so I need something quick and easy. How would these taste if I put them in the refrigerator or freezer and warmed it up the next day? I made this for breakfast today using wheat multi-grain flat bread. Outstanding! You're becoming quite the little Rachel Ray. Thanks so much for the nutritional information. Both of my children are diabetic and it is SO helpful to have the info on food, I don't usually see it on sites! I have many frozen strawberries in my freezer. Do you think they would work? I'm gonna try this for a sweet dinner, thanks! Just to mention that when I used ‘caloriecount.com’ for this, it said they were 350 cals but I suppose it depends on the brand of tortilla you use because I would buy Sainsbury’s whole grain 10″ wraps which are 170 cals… (I’m from the UK so I appreciate that American’s won’t be buying these). Just thought I should point out the nutritional info is not exact, its only a rough guide…. Yes, I typically use a low carb tortilla that’s around 80-100 calories. 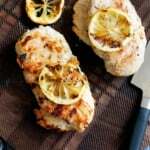 we just made these for lunch and they are delicious! While I’ve made wraps with the same ingredients in the past, heating it up brought it to a whole nother level! Can you use corn tortillas? Would that not taste good together? Why does this recipe call for whole grain tortilla but your nutritional info have flour tortillas? Doesn’t make good sense. That’s why there is a note. Hello, I’d like to know if i can make these and freeze them and then in the morning just place them in the skillet and eat them. Is it possible? Or I have to make them innthe moment? I made this and ate it so fast I didn’t have time to take a picture. Just wanted to say thanks for the as always, delicious recipe! I loved it! It looks good, even if a quesadilla (literally translated “cheese tortilla”) it is not. What size of quesadilla do u recommend? 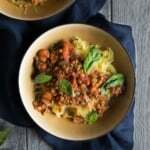 I see so many recipes but they never state size. I did not have strawberries so I used jam and it was DELISH. Hi Sophie! I think that should work just fine 🙂 Enjoy!